1. No School.......Due to storms my son had no school today. It threw me for a loop but he was able to stay at daycare all day. I'm grateful that he doesn't go to before/after care at school because they weren't open either due to power outage at the school. Now I need to take this as motivation to stock supplies in case this happens at our house! 2. Feeling congested.....Since I went on a field trip last Thursday at a State Park I have had a stuffy/runny nose and a cough. I am so ready to be done with it! I've tried sinus medicine, hot tea, running it off, and taking it easy but it doesn't seem to go away. 3. Boys Scouts..... My son joined as a Tiger and it is 6 times more expensive then the Girl Scouts. I hope he enjoys this for all the money we are spending. I'm looking forward to being part of this group but I still feel like an outsider at this point. 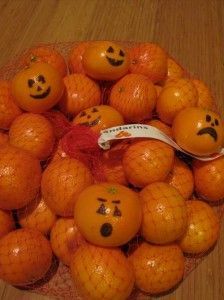 I hate all the candy that can come with holidays, kicking it off is Halloween so why not reinvent healthy foods. My daughter and I finish our first 5k together and it was my best time yet. We didn't win any age awards but my daughter was awesome for doing her first race and only having about 3-4 weeks to train.